We started the weekend at the Town Centre Hotel here in Powell River with a Friday night welcome session and Camera Basics workshop. After some intro presentations from the three pros, Kelly Funk led a session on Camera Basics, a hands-on session aimed at understanding exposure, lighting, camera functions, shooting modes, ISO, composition basics, etc. The biggest challenge we threw out there was that all participants shoot in only Manual mode from here on out. Although some were admittedly a bit intimidated by this at first, the Camera Basics workshop armed them with the right knowledge to achieve this goal. Goodbye Auto Mode! Everyone was ready to get some sleep and head out into the field bright and early on Saturday morning. 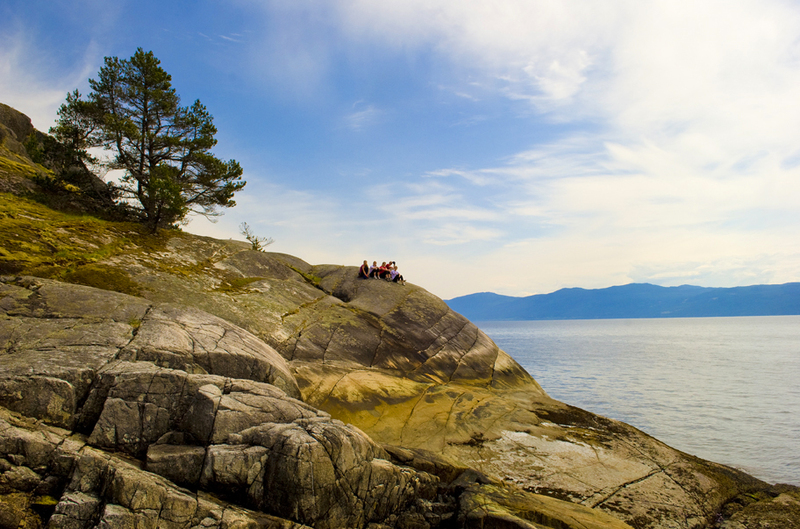 The rain continued to hammer us on Saturday as we headed out to beautiful Stillwater Bluffs south of Powell River, a location that offers some incredible vegetation, vistas and wildlife….when the weather cooperates (see image of the bluffs below from two short weeks ago). The group was told to “find their vision first” and start capturing it in-camera by applying some of their newly acquired knowledge. The pros spent the next few hours one-on-one with the participants, helping them to achieve their image objectives. We got soaked, but wow was it ever fun. And we quickly saw a vast improvement in quality of imagery from this group. Off to the next location ~ Eagle Falls. Some of the group opted to go dry off, while the rest of us ventured up the highway to iconic Eagle Falls to learn the art of shooting water. 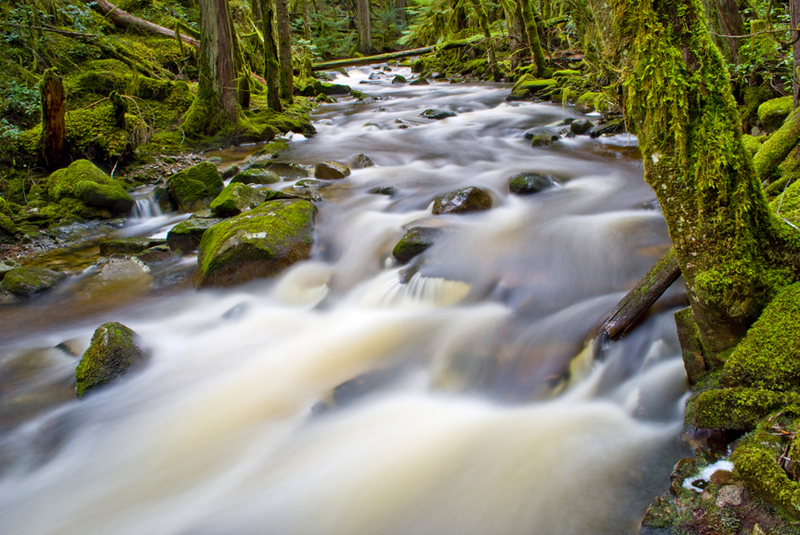 The wet weather created an ideal lighting situation for long exposures and high apertures. The group really enjoyed this leg of the shoot. 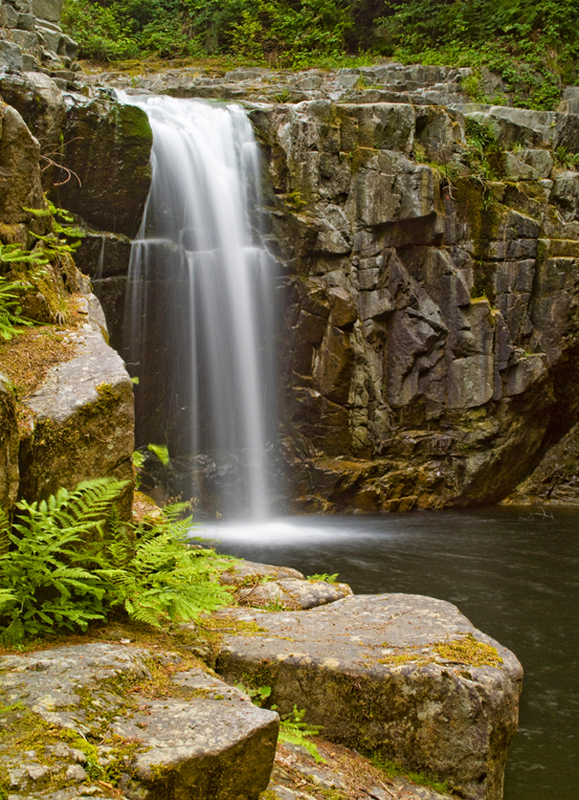 Below is a photo of Eagle Falls in happier (sunnier) times. After a quick lunch, we headed back into the classroom for a more in-depth look at lighting and exposure with Kelly, followed by a workshop session on compositions led by myself. The group really started to get a firm hold on the elements that comprise great imagery during these sessions. Then it was time to apply these elements to their own works. Before the event, the participants sent us what they believed were their three best images for a professional critiquing. During this session, the group really started to see what they would change about their images and their techniques. After dinner we headed out for our….ehem….sunset shoot. Okay, so there was no sun around to set, but that didn’t stop us from playing with lightpainting. Lightpainting is an artifical lighting technique that, if done properly, can render some very surreal and impactful images. Basically, while shooting in low-light situations, you use long exposures and “paint” light on your scene (or scene elements) using a bright artificial light source, in our case a 10 million candle spotlight. An example is my image below. 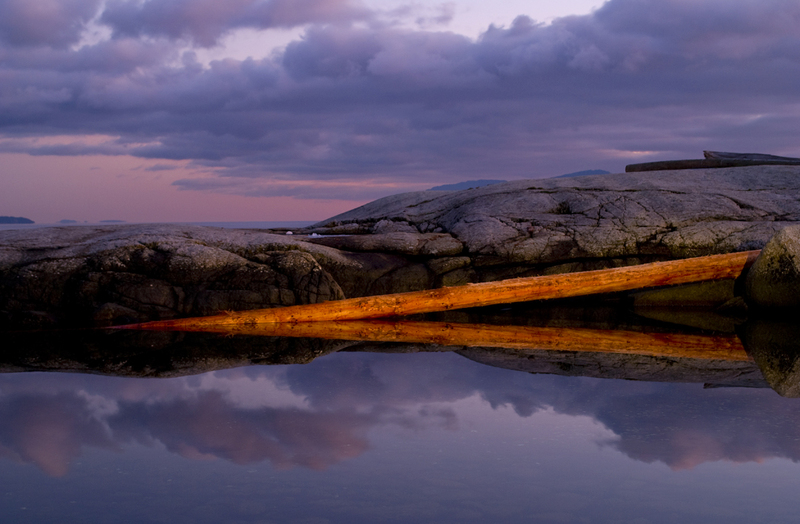 The exposure was 20 seconds just after dusk as I painted the log for the duration of the exposure. Again we got soaked. Again we had a blast and learned a lot! Sunday turned out to be the highlight of the weekend, location-wise and weather-wise. 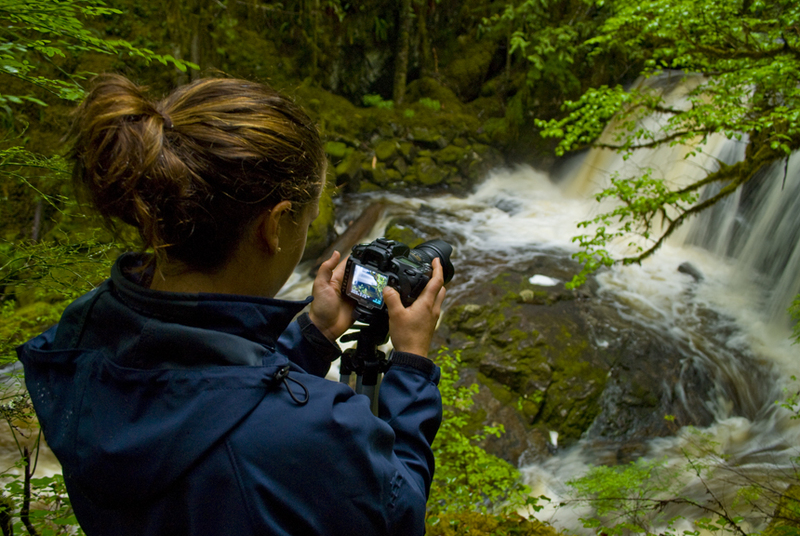 We went to the Appleton Creek trail north of Powell River to shoot a series of captivating waterfalls. The group starting producing some great imagery here and got really inspired by the overwhelming beauty of the area. We spent about three and a half hours here and in all honesty I had to pry many away to our next endeavor…..Willingdon Beach. We wrapped up with some field demonstrations on action photography by having them capture Kelly and myself taking turns swinging through the air on a zunga (rope swing). All in all, the weekend was a tremendous success and we look forward to next year. 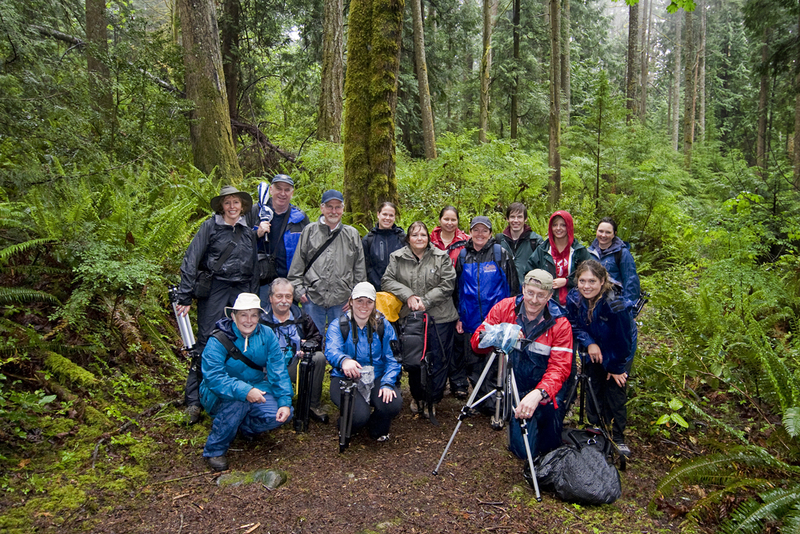 We are currently evaluating the possibility of offering a fall workshop series on the lower Sunshine Coast, stay tuned for details as we iron them out!